Many of the preseason projections are done with an air of confidence. When a successful team returns a roster of full of impact players it doesn’t take Nostradamus to know that they’re headed for season full of wins. What is hard to prophesize is which dark horse teams will make the transition from being an also-ran to a full-fledged contender. Every season a handful of clubs elevate themselves from middle-of-the-pack position to the top of the standings. It’s a big part of the reason what makes sports stories so entertaining. Everyone loves a good underdog (that is unless you’re their opponent). This week a trio of teams are featured in each of the three small school divisions that have made a unanticipated move into the Top 25. Their omission from being listed as a preseason pick further establishes that games are won on the diamond and not on paper or some statistical database. Preseason accolades are nice, but they pale in comparison to a postseason titles, an honor each of these teams would unequivocally much rather have. Rankings are based on games through Sunday, March 26. The Wildcats advanced to the CWS in 2014, but stumbled the next spring, falling well under .500 with a very unChico-like 18-25 record. Last season was more to Coach Taylor’s standards with 35 wins and a CCAA tournament title, but that accomplishment also included a robust 22 losses and a shellacking out of the national postseason, losing their two West Region games by a combined 4-23 margin. There was plenty of reason for optimism headed into this season with a solid core of returners; however there wasn’t too much to get overly hyped up about on paper. Chico looked good, perhaps gosh darn good even, but not quite great. The ‘Cats’ Top 25 candidacy was put in the proverbial “receiving votes” category, a decision which has proven well to be a complete and utter miscalculation. The Wildcats are unequivocally exceptional and are a legitimate national title contender. Chico has won 24 of 29 games this season and has only lost once since February 20. On the rare occasion that they have tasted defeat, the loss was by a narrow margin. Three of their five losses were by a single run and the other two were only by three. Their most formable regualr season competition is behind them, with only a series against UCSD keeping them from running away with the CCAA regular season title. A key component of their surprising success has been the addition of a pair of starting pitcher transfers in Casey Costello and Cam Greenough. After transferring from Orange Coast College, Costello has earned the win in six of his eight starts and has limited opposition to less than a single earned run per nine innings with a 0.77 ERA. Greenough has been nearly just as dominating, holding Wildcat opponents to a .225 batting average with 37 K’s in 44 innings with only eight walks allowed. With the loss of John Silviano – who batted .405 and hit 30 home runs in a season – and a pitching staff which had a 7.23 team ERA last season, the Knights didn’t have the look of a team which would be able to go toe-to-toe with the likes North Georgia and Florida Southern. Yet, Lynn has won a series over each which means they have the ability to defeat anyone. The Buffs have consistently been a power program over the past couple of seasons but haven’t managed to match the national success of regional rivals Angelo State and St. Mary’s. This could be the Buffs year as they’ve been nearly unbeatable with a 21-5 record and are punishing opposing pitchers by scoring nearly nine runs per game. The outlook for Indiana Tech was optimistic at the beginning of the season and for good reason. The Warriors were coming off a 40-20 season, their winning-est season in nearly 10 years, and had returned to the NAIA tournament for the first time after an uncharacteristic two-year absence. On the flip side, however, Tech was going to be without First-Team All-American Brian Hakes, who had became just the third Warrior in program history to earn such an honor, and ace James McReynolds, who had signed with the San Rafael Pacifics over the summer. If Indiana Tech was going to improve upon the previous season’s success, it was going to require a number of players to elevate their game. Tech looked formidable, but nothing like the juggernaut they’ve demonstrated to be this season. The Warriors’ 19-7 record through last Sunday includes wins over some of the toughest teams in the nation. Tech has a pair of wins over No. 8 Tennessee Wesleyan and another two over defending national champion No. 22 Lewis-Clark State. They’ve also outlasted No. 14 Northwestern Ohio, an extremely quality Concordia (Mich.) club and held the lead late against No. 9 Georgia Gwinnett as well. Transfer Matt Bandor has been a boon to the Indiana Tech run commodity, topping the team with a .439 average. Tighe Koehring managed a respectable .279 average last season but is swinging a .367 stick this spring. The elevation in his game, along with Glen McClain, who has improved his already impressive .334/.414/.469 slash line to a even more imposing .438/.495/.604, are a major reason Head Coach Kip McWilliams’ offense has become a virtual powder keg. In just one inning last week the Warriors scored 18 runs and hit five home runs as part of a 33-8 dismantling of Marygrove. Lucas Erceg and Garrett Gemgnani combined for 37 home runs last season but both were lost to the professional ranks. However, another slew of sluggers, led by Jordan Getzelman, who already has already hit a Roy Hobbsian 19 home runs in 114 at-bats, has the Oaks among the nation’s elite. After starting the season 3-4 the Eagles have impressively won their last 18 games in a row. Its been quite the turnaround for the CMU as a program as it was just two seasons ago the Eagles finished back-to-back seasons below .500. The Panthers earned 30-wins last season, a plateau the program hadn’t reached since 2005. On the heels of that success LaGrange was picked first in the preseason USA South coaches poll headed into this spring. Despite the warranted optimism, there was some trepidation in going all in on the Panther’s postseason prognosis. Their 2016 win total was a part of a remarkable turnaround from the previous springs in which their total wins didn’t match that mark combined. 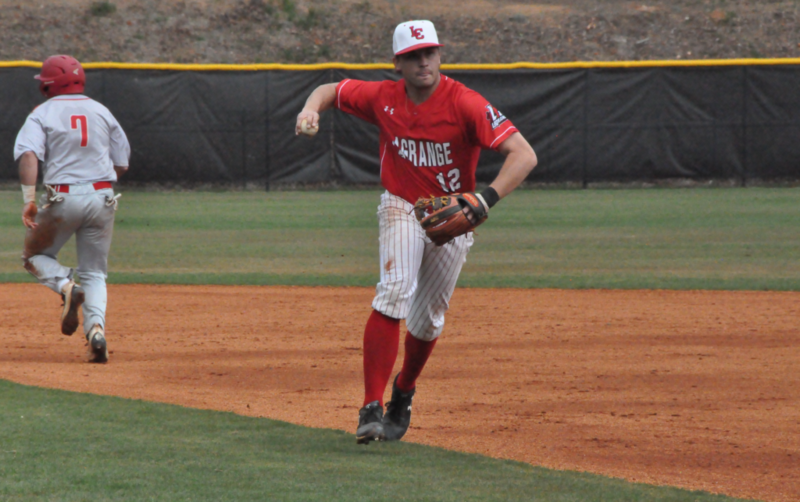 In 2014 and ’15 LaGrange’s records were 13-24 and 14-23 respectively so the team’s recent success could have been seen more of an aberration than expectation. This season has shown that the Panthers are indeed legit. David Kelton is in his fourth year at the helm of the program and has his club making strides in every facet of the game. LaGrange is hitting .337 as a team and has an on-base percentage among the nation’s leaders at a smart .430 mark. Blake Butcher, the 2016 USA South Player of the Year,has built upon last year’s stellar numbers and will likely take home the honor once again. The pitching staff has a 12th-in-the-nation 2.84 ERA and has been one of the most stingy when it comes to allowing runners on base. In 247 innings Panther pitchers have only allowed 232 his and have incredibly allowed only 51 base on balls. Their 26-2 record doesn’t have a lot of highlights when it comes to big-name wins, but they did have a convincing victory over Emory last week and have had two close games against Birmingham Southern. While their schedule hasn’t been thick on quality opposition, the Panthers are prevailing convincingly. Only three of their wins have been a single run and over half of their victories have been by a five run margin. With the wins LaGrange has climbed the D-III rankings almost exponentially and currently round out the top 10. The Maroons 23-17 record last season was their best in program history and only their second spring finishing over .500 since the program’s varsity inception in 2002. As such their 17-7 record this deep into the year has been a pleasant surprise. The Comets haven’t reached 30 wins since 2007 when they were last nationally ranked and advanced to regional play. With a 18-4 record so far this season UTD is well on their way for their best finish in program history. Dropped out: Concordia (22), Whitworth (24), West New England (25).